In honor of North Carolina Wine Month, our estate chefs created this traditional North Carolina recipe – delicious in September or any time of year. Preheat oven to 275 degrees. Cut salmon into four 4-oz. portions. Line a sheet pan with foil and brush lightly with oil. Season both sides of salmon with salt and bake 15-17 minutes until center is just opaque. Combine mustard, curry paste, and lemon juice in a bowl and season with a pinch of salt. Thin with a small amount of water if too thick. In another bowl, combine cider vinegar with sugar. Core apples and fennel, and cut into thin strips, adding them to the bowl of vinegar to prevent oxidation. To serve, arrange four plates and spoon curry mustard in thin layer on base of plate, reserving a little. Combine oil, Bibb lettuce, and mint in bowl with vinegar, apples, and fennel. Toss to coat lettuce and season with salt. 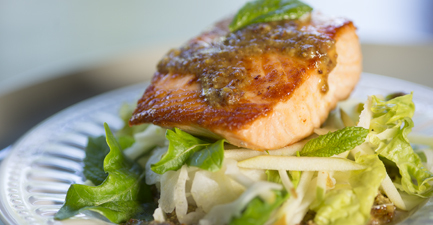 Arrange salad on plate and top with salmon and a drizzle of reserved mustard sauce.